For use on 1970 - 1981 Camaro Firebird Trans Am models with the deluxe exterior molding package. Cast original hard die cast material. 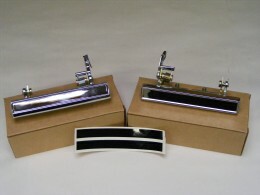 Heavy chrome plated and show polished. Exact reproductions these units mount UNDER the weather seal retainer trims. These units provide the chrome accent molding trim that run up and down the B pillar posts at the backside of the side glass. Cast original hard die cast material. Heavy chrome plated and show polished. Exact reproductions these units mount UNDER the weather seal retainer trims. 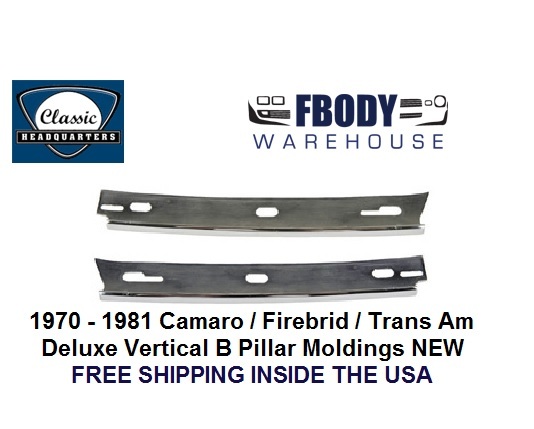 These units provide the chrome accent molding trim that run up and down the B pillar posts.